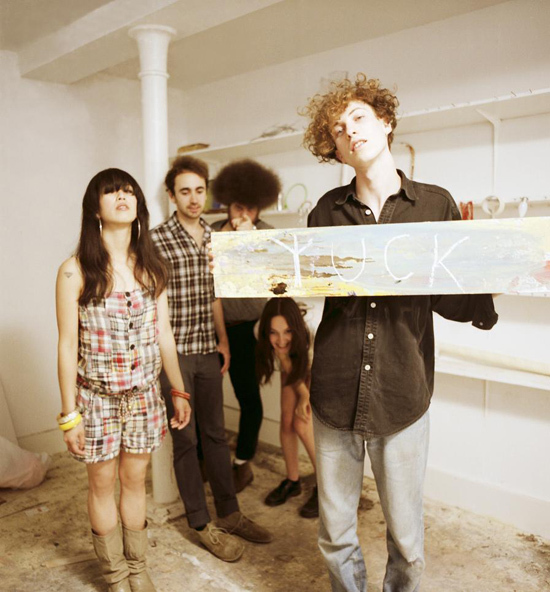 Yuck is what you get when you take two dudes from London band Cajun Dance Party, add your sister for supporting female vocals, and then throw in a Japanese female bassist and a drummer from New Jersey. Daniel Blumberg and Max Bloom, the aforementioned two dudes, met in Israel although both are from London. They connected over an Animal Collective t-shirt. They later found their drummer in Israel, as well, although at the time he was still a college student in New Jersey. They all decided to give up any other plans they may have had to join the London music scene. And they were soon labeled "Revival Grunge." "It’s weird that there’s a certain label of bands called ‘grunge revival’ when there’s been guitar bands consistently making amazing music. There hasn’t been a stop or start or anything. There’s just been more attention given to it" explained Max Bloom. Revival grunge? Meaning this is what grunge is now? Hmm. Paul Lester from the Guardian calls it more like a "shoegazey Sonic Youth." YES. That's it. Shoegazey Sonic Youth. Or Dinosaur Jr. Or Teenage Fanclub. There you go. Quite honestly, I think their best track is "Rubber", which closes out the album and lasts 7 minutes and 14 seconds. Mogwai remixed it and managed to stretch it out to 8 minutes. The self-titled album is interspersed with slow and brooding tracks like "Rubber", a few faster but oddball love songs, and a few good ones that mix the two, like "The Wall" and "Operation." Slottsfjel Festival in Norway today, can I get a shout out?! ;) OK, how about Pitchfork in Chicago on Sunday. Milwaukee, Minneapolis, Seattle, check your venues, because Yuck will be there soon. Full tour list on their MySpace - and yes, they update it!